The Walking Dead S9.15 review: "A tragedy that’s sensitive, graceful, and close to poetic"
What was it Robert Burns once said about the best laid plans? We knew The Walking Dead season 9’s penultimate episode, The Calm Before, would focus on the trade fair. We knew it would feature a Game of Thrones-style Red Wedding massacre of devastating scale. But nobody suspected it would hit like this. And by “this”, I mean very, very slowly. But that’s not a bad thing. In fact, I applaud AMC for holding back from excessive bloodshed and instead presenting a tragedy that’s sensitive, graceful, and close to poetic in the way it’s told. Warning: spoilers for The Walking Dead season 9 continue below. For starters, The Calm Before is very much about the calm before, spending almost all of its runtime on the frivolities and festivities of the trade fair between the allied communities. That decision to play the long game works on multiple levels, largely because it allows us to spend time with characters in a safe environment, watching them interact in intimate scenarios to reveal sides of themselves we hadn’t yet discovered. 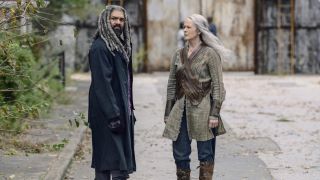 Did you know that Judith hadn’t seen Ezekiel (Khary Payton) and Carol (Melissa McBride) since her Dad died? Or that Connie (Lauren Ridloff) is still dealing with the trauma of losing a baby in the old world? Me neither, but these quiet moments of human conversation are ideal for colouring our survivors beyond an iconic weapon or fighting style. The long road to a shocking climax is also a classic tool for building suspense, lulling us into a false sense of security before the inevitable gut punch. I’m sure many viewers were eagerly awaiting some sort of grand attack on The Kingdom, but AMC knows we’re far too desensitized to that to be shocked by open combat at this point. Instead, The Calm Before uses Alpha’s (Samantha Morton) association with subterfuge for a more subtle, secret invasion, to the point where every major death happens off screen. Speaking of, to see The Whisperer’s leader walking around The Kingdom undercover in bright summer clothing (and a wig scalped from the head of a recent Hilltop victim) is oddly discomforting. It reminds us that, at some point, Alpha was once a normal person who could have fit right in at the fair, but episode 15 proves once and for all that she’s a villain to be afraid of. If you’ve read the comics, you probably have a good idea of what’s coming throughout the events of The Calm Before, but even then, AMC manages to keep you guessing. Humanising scenes of various characters enjoying themselves at the fair are devious red herrings, designed to make us prepare for their impending exit, before the full… ahem, lineup is revealed to be anything but predictable. Cutting between the graphic shot of each head on a pike and the first signs of their disappearance a few hours earlier is all that’s needed to evoke the emotional reverberations of the loss, and make us forget the fact that over half of these zombified craniums are minor characters, some of whom I couldn’t even name off the top of my head. Carol’s measured but broken response to the sight of Henry (Matthew Lintz), in particular, is hard to watch, especially in the way it calls back to the loss of her other child, Sophie, all the way back in season 2. I’ll admit, I’m happy to see the village idiot pay for his many, many mistakes, but that doesn’t make Carol’s bereavement any easier to witness. If The Walking Dead season 8 was a clumsy rumination on the tension between mercy and wrath in times of war, season 9 is about the competing values that different survivors embody in their way of life. The Whisperers find the civilized conduct of Hilltop, Alexandria, and The Kingdom to be a frivolous affair with an era that can’t be brought back, while the defectant Lydia now understands that survival for survival’s sake is no life at all. That clash of cultures came to a bloody head in The Calm Before (pun intended), and the last minute tease of an impending winter (another Game of Thrones parallel) suggests we’re moving into an era of cold war between the two communities, one of whom just wants to be left alone, and the other vying for revenge. "At this point I’d be foolish to question showrunner Angela Kang’s ongoing vision"
I’m not thrilled at the idea of another time jump (an emerging trope The Walking Dead seems to be increasingly relying on), which again bypasses the need to spend any time grieving for fallen comrades, but at this point I’d be foolish to question showrunner Angela Kang’s ongoing vision for the show. As proven by several episodes throughout season 9, and indeed once again by The Calm Before, she’s brought The Walking Dead firmly out of its nest of mediocrity, and I’m confident she can keep that momentum going through to its finale. Verdict: The Calm Before turns an iconic Walking Dead moment into something unexpectedly powerful, cementing season 9 as a new high bar for the show.